New for 2018/2019 is the introduction of Groups Plus Premium, an extension of the existing benefits available with Groups Plus but with more concessions with participating hotels. This includes: when a group of 10 or more adults book a vacation, the 8th passenger travels free; two people travel free when a group of 16 book; or three people travel free when a group of 24 books. Benefits are also available on pre-booked Sunwing Experiences, where the 21st customer travels free on group excursions, and private transfers are included for groups of 12 or more. Group Pricing is also available for cruise packages with MSC Cruises, Norwegian Cruise Line and Marella Cruises, where the 16th adult travel for free (excludes taxes and fees) on bookings with a minimum of eight double cabins. In addition, agents who confirm their customers’ bookings by 28AUG, 2018 can earn 10x STAR Agent Rewards points. The Sunwing Platinum Club is also featured in the guide. Through this club, agents can earn free seats, Elite Plus upgrades and excursion credits with group seats booked under deposit with Sunwing Vacations. Rewards are tiered and depend on the number of bookings an agent makes. Sunwing’s STARmillionaire promotion is also in effect, giving agents the opportunity to win one million STAR Agent Reward points that convert to cash. Agents can qualify by booking a group of 10 adults or more between 28MAR and 28AUG, 2018, for departures from 1NOV, 2018 onwards. Each new booking confirmed counts as a ballot. The Groups Guide is distributed throughout travel agencies. 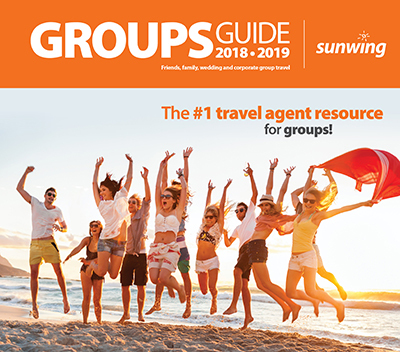 An online version of the Groups Guide can be found at www.sunwingagents.ca.